I was thinking about Star Wars last night and it occurred to me that although they were able to invent hyper-space travel, light-sabers and battle stations that could blow up an entire planet, they did not invent the internet. 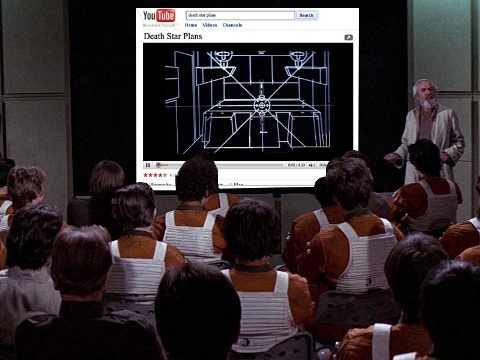 Imagine how different it would have been if instead of many Bothans dying to get the Death Star plans to Princess Leia, one Bothan had simply uploaded the plans to YouTube. The plans would instantly have been made available to the Rebel Alliance, Darth Vader would not have had to hunt down Princess Leia. Obi Wan Kenobi would not have been the Alliance’s only hope. Princess Leia would not have needed to send him the droids (thus avoiding the inconsistency of his not recognising them, despite their key roles in Episodes I to III). Luke Skywalker would have remained on Tatooine, living the tedious life of a moisture farmer and having unfulfilled dreams of becoming a star pilot. Han Solo and Chewbacca would have continued their lives as smugglers, probably dying in a brawl in some seedy cantina somewhere. Once the secret weakness of the Death Star became public, the Emperor would have sold it to an entertainment consortium as a theme park (and Alderaan would have been spared), and would have recouped the cost of building it tenfold, thus having the money to build up a conventional fleet with which to defeat the Rebel Alliance, which would have remained on Yavin until its merciless crushing and not have moved to either Hoth (thus depriving us of the excellent Episode V) or the forest moon of Endor (thus depriving us of the ridiculous Ewoks). Although none of this would have spared us from Episodes I to III.